A mentor of mine used to say, and I believe he was quoting Scripture in some vague way, “Never treat as ordinary that which has been consecrated to you.” In other words, if something is special, treat it as such and don’t let it become mundane. A few weekends ago my good friend and partner in youth ministry, Tom Burnett, led a trip into a remote area off the Echo Trail for a winter retreat in a rustic cabin. We were joined by Tom’s son and five other young men from Nett Lake, and the eight of us trekked through the snowy woods with headlamps and backpacks until we arrived at the cozy, one-room cabin deep in the forest. We arrived in the dark on Friday evening, later than conventional dinnertime, so without hesitation Tom started a fire in the wood stove for the duel purpose of warming the taco meat his wife had prepared and to establish the heat source that would sustain us through the night. 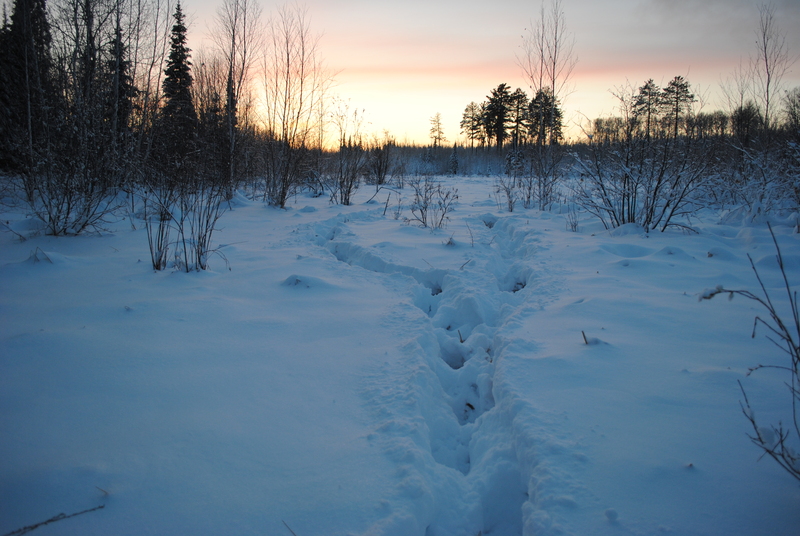 Meanwhile, a few of the young adventurers and I wandered our way through an un-trodden trail until we arrived at the sauna, somewhere between the cabin and the lake. We kindled the fire in the stove and amply stoked it, though it would be a couple of hours before we’d return in our swimsuits. Our headlamps then guided us to the lakeshore where we stepped out into the soft, snow-lit darkness of the vast ice field; the quiet solitude of the winter forest disturbed only by the conversation of friends. Reconvening at the cabin, we filled our tortillas with meat from the cast-iron skillet and enjoyed our meal under the glow of lanterns. Two of the older boys then dug through their backpacks and handed Tom packages of wild game they’d brought to share. Tacos were followed by strips of delicious venison; and finally, the chocolate chip brownies we’d all been eyeing since arriving. Our food settled in our stomachs and we collectively settled into the warmth of the small cabin while stories, jokes, and laughter flickered like firelight. As the evening continued, Tom and I found ourselves in the sauna with the two youngest travelers. We joyfully dripped sweat from our chins and occasionally slipped outside to flop in the snow or to collect buckets-full for eating and pressing against our faces in the heat. When the fire waned we waltzed again through the darkness and this time found the cabin floor covered with high school boys sprawled out playing UNO between piles of sleeping bags and pillows. More stories. More laughter. Eventually we dowsed the lanterns and spread out among the bunked queen beds and spare mattresses, settling in for the night. My experience in these sorts of settings is that this twilight time – the time in the darkness before sleep sets in – often fills itself with meaningful conversations and pressing questions from inquisitive young people. This night was no exception. As Tom and I lay on our backs we entertained questions about God, eternity, and the stories of our lives in which these questions become relevant. Sleep captured the youngest first, but gradually the space between words grew longer until we all slumbered and snored until daylight filled the cabin. The morning was spent wandering the woods, munching down pancakes smothered in tasty venison gravy, and listening for wolves howling across the wooded hills. When it was time to leave we stuffed our backpacks and swept our way out the door, this time navigating our way by daylight on an oddly mild December morning. “Don’t treat as ordinary that which has been consecrated to you.” Perhaps this story would be better had we encountered a pack of ravenous wolves patrolling the lakeshore by moonlight, or been stopped by a slobbering troll beneath the Little Indian Sioux River bridge. But this was an ordinary night in the woods in an ordinary cabin with ordinary folks. However, it is precisely these sorts of experiences that are consecrated to us: Nights free from distraction and discord. Nights where we can get down to the business of doing nothing. Nights where we fill the spaces between us not with the endless noises that insulate us from one another but with laughter and warmth and thoughts about God. Don’t treat them as ordinary.